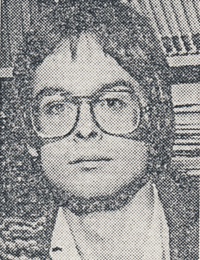 Before Freedom Party of Ontario was founded in 1984, one of the founding members of the party – Marc Emery – was the publisher of the London Metrobulletin, the owner of the City Lights Book Store in London, Ontario, and a recent candidate for alderman in that city. By 1983, his activism and publishing had made him a well known proponent of individual freedom in the London area. This is Bill Paul’s first interview of Marc Emery. Emery discusses his political orientation, feminism, libel laws, his 1980 founding of the London Tribune newspaper, his newer London Metrobulletin tabloid, Ayn Rand, and more. The exact date of the interview is not known, but Paul and Emery discussed the fourth issue of the London Metrobulletin, which issue included a reproduction of a passage from the December 2, 1983 Ontario Hansard, which indicates that this interview was recorded in December of 1983. A radio editorial by Georgie Banks, who gives her opinions about Marc Emery’s new weekly newspaper, The London Tribune. She notes that the paper, on its first day of publication, broke a new story about a scandal at the London Art Gallery. A “close-up” profile by radio CJBK AM 980. Marc Emery is interviewed about his London Tribune weekly newspaper, which is launching that day. The paper’s first issue is free. Emery opines that the daily newspaper is a thing of the past, given the ability of radio and TV to provide up-to-the-minute news. Profile: is there room in the market for The London Tribune? Just days before the launch of a new London weekly newspaper spearheaded by Marc Emery (The London Tribune), this news report interviews the editor of the London Free Press, William C. Heine, who says the evidence suggests that it is not economically viable to run more than one daily newspaper in a place like London that has a population of less than 1,000,000 people. Heine is asked what happens when a two-paper town to a one paper town; he points out that almost all newspapers are now owned by only two companies, Thompson and Southem. Marc Emery is interviewed and speaks out against government subsidizing failing newspapers. Heine says that new technology, such as the word processor, is allowing newcomers like Emery to publish a competitive weekly magazine at an affordable cost. Emery adds that a daily newspaper is becoming obsolete because of electronic media like radio and TV that can deliver information instantly. He adds that The London Tribune will offer something different from the London Free Press: it will focus primarily on local news. 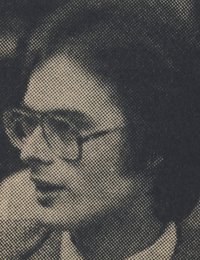 To promote the newspaper, the company is advertising on radio, on buses etc..
Ron Thomas interviews Marc Emery, Doug Phippen, and Gary Webb Proctor about their new weekly newspaper, The London Tribune, which will launch in September, 1980. The paper will be published on Thursdays. The interviewees are asked about the cost of running the paper, its editorial policy and political orientation, and whether the paper will be a platform for Marc Emery’s political efforts. In this brief news radio clip, it is reported that London council has decided to hand over its troubled downtown kiosks to Marc Emery, who has offered to clean them up and maintain them in exchange for the revenue he earns from advertisers using the kiosks. In this news item, it is reported that Marc Emery will be challenging a resolution by London City Council that approved a $100,000.00 budget for a London Business Improvement Area (BIA) association that, pursuant to a provincial law, could be formed and funded by taxes imposed upon businesses within the area. It is reported that the motion is to be heard by the Ontario Supreme Court on June 26. In this extended news item, Marc Emery explains why he is opposed to the new Business Improvement Area tax in west London, Ontario; he explains that 1/3rd of the number originally queried about imposing the tax are currently opposed to the tax, and that Emery expects to find 85 to 90% of business persons in the area to be opposed to it. He explains that about 300 businesses were needed to oppose the imposition of the tax, and that about 110 did oppose (however, the vast majority of the 850 or so businesses polled about the tax did not respond to the questionnaire, and the absence of their response was taken by the city to be equivalent to a vote in favour of the tax). Emery submits that about 15 or 20 businesses were able to get the tax imposed. He submits that although 800+ businesses will be forced to contribute taxes, only about 30 businesses will benefit from the money spent (the other businesses being too far away from where the money will be spent). A full 6% of the $100,000.00 in tax revenues collected will come from just one of the 800+ taxed businesses: insurer London Life. This recording is a combination of two recordings, the second – having occurred one day later – was London Mayor Al Gleeson’s response to Emery’s position on the BIA tax. Gleason essentially takes the position that, for those who were out-voted, “too bad”. He takes issue with Emery’s submission about only 30 businesses benefitting. He also explains that the enabling provincial legislation was imposed in 1977 (which was a year in which Ontario’s Progressive Conservatives were in government). Radio show “Voices” profiles the ongoing dispute between Marc Emery (who, in 1984, would co-found Freedom Party of Ontario) and west London’s business community (and Mayor Al Gleeson) over the imposition of a new tax on business owners in west London. It is reported that Emery will not pay a new Business Improvement Area (BIA) tax, and could face court action if he does not pay. Marc Emery describes who was motivated to ask for the tax and why. He explains that businesses should be free to spend their own money advertising as they see fit, rather than being forced to pay into a pool that will be used to promote the downtown (which, he explains, will not work). Jack Blair, president of the Downtown Business Improvement Association says that those who oppose the tax simply do not understand the benefits of what it will achieve. Mayor Al Gleeson is heard stating that the tax is a legal by-law and that the city will seek enforcement through the courts against a person who does not pay it. He criticizes the validity of Emery’s petition (which he is circulating among other store owners in the area) and says that Emery should spend his efforts supporting the BIA, rather than opposing it. In this brief news item, it is reported that Marc Emery appeared before a special meeting of the London Board of Control and offered to assume control of London’s downtown kiosks that have become eyesores, covered with posters. He proposes that he will take care of the kiosks if he is permitted to keep the advertising revenues. Tongue-in-cheek, Emery explains that he’ll set aside two kiosks for public postering purposes so that the people will not poster the rest but, if they do, he’ll have the perpetrator covered with glue and postered, then handcuffed to the kiosk with a sign explaining why he’s in the state he is in.